The 2010 Native American $1 Coin 25-Coin Roll includes coins that are a continuation of the Sacagawea Dollar that first appeared from the United States Mint in 2000. Starting in 2009, the reverse (tails side) design of the coin started featuring elements which celebrate the important features Native Americans have made to the history of the United States. The 2010 coin shows an image of a Hiawatha Belt wrapped around five arrows. It represents the Haudenosaunee Confederation which was established by five Native American tribes as a diplomatic and political entity in the early 1400′s. The original Sacagawea Dollar was first minted in 2000 and carried the same obverse image as we find on the coin today of the famous Native American woman who accompanied Lewis and Clark on their expedition through the Louisiana Purchase. The reverse design when first issued showed an "eagle in flight" and was designed by Thomas D. Rogers. Starting in 2009, the Sacagawea Dollar became the Native American Dollar with reverses changing annually to honor Native American contributions to American history. On the reverse of the 2009 strike, an image of a Native American woman planting seeds of corns, beans and squash in the "three sisters" method. Circulation quality 2010 Native American $1 Coins were struck by the Mint to be used in everyday commerce. A small portion of those struck were wrapped by the Mint in 25-coin rolls and sold directly to the public by the Mint. Those interested in buying a roll have the choice between coins struck at the Mint’s facility in Denver or the Mint’s facility in Philadelphia. The US Mint released the 2010 Native American $1 Coin 25-Coin Roll on January 22, 2010. Twenty-five coin rolls of the 2010 Native American Coins have an issue price of $35.95 directly from the US Mint. The Native American Coins are struck to circulation quality at either the Mint’s facility in Philadelphia or the Mint’s facility in Denver. 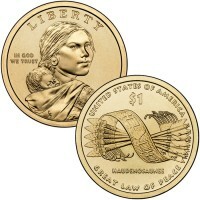 Glenda Goodacre designed the image of Sacagawea which is featured on the obverse (heads side) of the coin. The reverse (tails side) image of the Hiawatha Belt and five arrows was designed by Thomas Cleveland & engraved by Charles L. Vickers.